Love compelled Jesus to the cross. Love rose Jesus from the dead. Love leads Jesus to intercede for us right now. On this Easter Sunday, the Savior of the World invites you in loving relationship with Him. Surely, this was a righteous man. Surely, this is a righteous man. Surely, He is the Righteous One. The death of Jesus on the cross was no ordinary event. It marked the exact time when the debt of our sins, that could not be paid by man alone, were paid in full. The blood of Jesus satisfied our debt and granted us access to the Father. When we pray, we pray in the name of Jesus because His life granted us the authority to boldly approach the throne of grace. But for the enemies of Jesus, this was the end. No more need of a rousing prophet and preacher who said He was the Son of God. Yet, his actual death sparked reactions that were surprising and alarming. In Luke 23, we see that the event was so impactful, even doubters and skeptics said the word SURELY. In death, Jesus revealed His divinity for those who wanted to see. While the enemies of Christ and the Father of Lies surely celebrated the final breath of Jesus on this side of eternity, these same enemies forgot who they were dealing with. As we think of the day of crucifixion and the day of resurrection, it’s the 2nd day in between that may stir up doubt, skepticism, worry and fear. Did Jesus really mean what He said? This question among others may taunt us today. Before a breakthrough, we wonder if it will come. Before the miracle, we question if God will show up right on time. Before the blessing, we may get weary in our belief that Jesus will be what He said He would be. Is He the One who can redeem, restore, and set free? 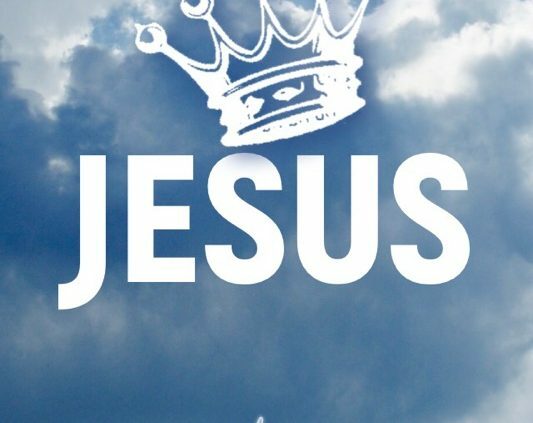 I can assure you, backed by the authority of Scripture, Jesus is the One. Love is best defined through sacrifice. When we witness a couple exchange vows on their wedding day, seasoned married couples know full well that this moment is a promise of commitment and love. These vows are tested by the challenges and opportunities that life presents. It’s the sacrifices by each spouse from day to day that leads to the success of a marriage. While words and verbal declarations are important, the fulfillment of those words through action carries even greater weight. This Scripture passage demonstrates that Jesus preferred another route to save the world from sin and eternal damnation. This “cup” was a hefty price to pay. “God made him who had no sin to be sin for us, so that in Him we might become the righteousness of God” (2 Corinthians 5:21). This sacrifice on the Cross of Calvary was a risky proposition. Jesus committed to die on a cross for a people that may ultimately reject Him. Yet, the promise of each member of humanity to become the righteousness of God (in right standing with the Father) was worth the risk. The reward was a people reconciled back to God. 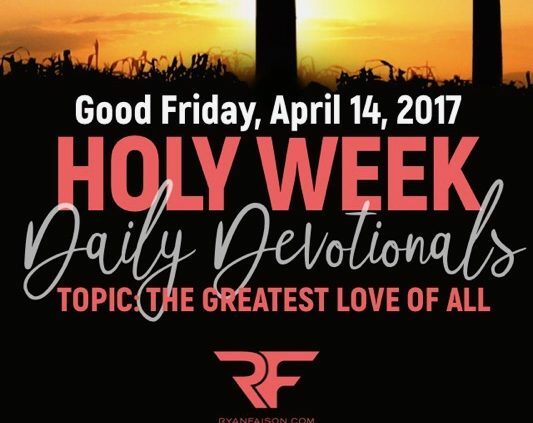 On this Good Friday, we are reminded of the great sacrifice of the Father. He surrendered His one and only begotten Son for the sins of the world. This day, we remember the sacrifice of Jesus, who surrendered to the brutality leading to and at the cross. Jesus took the ultimate risk for the reward of relationship with you. I know Whitney Houston was sang of “The Greatest Love of All”. No greater love was personified than Jesus laying down His life for His friends. On this Good Friday, we are reminded that death died so that we may have life and life more abundantly. What will you respond to the greatest love of all? When you reflect on the titles given to Jesus, any position or title we’ve ever had or will have pales in comparison. It’s not everyday that you hear someone called The Savior of the World. The reason for that is because there is only one. While Jesus walked on the earth, He could have carried these titles like a badge of honor, esteeming Himself and demonstrating His great power for recognition. But the Savior didn’t do that. The King didn’t choose that route. He humbled Himself as a servant. Jesus’ greatest service was to obey the will of the Father. This led Him to seek and save the lost. For there were many that didn’t even know they were lost or needed saving. I was in that place too. I attended church and understood religious terminology. I acknowledged and accepted the Lord as my Savior at the young age of 13. I was practically raised in the church. But, I soon discovered that Jesus was looking for more. Rather than merely attending church, He wanted me to be the church. He was still chasing me down. He wanted a relationship beyond the surface. He was seeking me out. Whether you are in a place of searching to discover the truth of Scripture or have embraced the Word of God as the final authority in your life, Jesus is still on a mission of seeking you. For God is not through with ministering to your soul, shaping your character and directing you into purpose. This chase and this pursuit led Jesus to the rugged cross on Calvary. As you read this right now, He is seeking you out. His love for you compelled Him to surrender His very life on behalf of yours. Let Jesus find you in a place of surrender. If you do, you’ll discover you have much in common with the One who surrendered everything for you. Lord, I recognize there have been times I have subtly or directly pulled away from Your Presence. I may have even rejected Your love thinking I was not worthy to receive it. Yet, Your pursuit of me and of others proves that You count us worthy. I position myself today to surrender to Your heart and Your will for my life. I count it a privilege to journey with you on this adventure called life. In Jesus Name, I pray. Amen. Whenever I receive an invitation to a wedding, I’m reminded of how much thought went into choosing the guest list. Each invitation comes at a cost: the reception venue, food, entertainment and the price of hosting family and friends. For a couple to think of me as a worthy guest to their most special day is an honor. While I enjoy the festivities, I’m acutely aware that someone paid for my plate! Like a wedding guest list, Jesus invites us in relationship. But, this is no ordinary relationship. Jesus (self-described most as the Son of Man) invites our humanity to connect with His divinity. While the invitation is extended, He doesn’t demand your acceptance. His desire is that you will come to embrace the call to follow Him. But, He offers a disclaimer. If you want to be a true Christ-follower, it will require a bearing of your own cross. 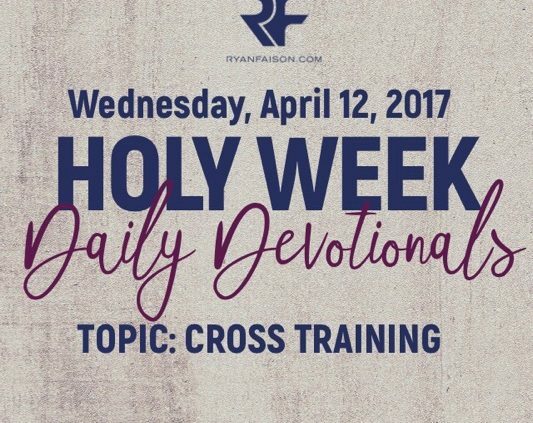 In essence, Jesus invites us into cross training! If we are going to give our lives over to Christ, there’s a price. There’s a cost. And anytime a cost is involved, you can expect a thinning out of the crowds. Everyone is not ready or willing to pay the price of following Christ. But, the Word encourages us to see the great benefits of doing just that! While salvation is open to everyone who will come in faith, discipleship is another thing altogether; it’s cross training! It’s a death to self. It’s identifying with the shame and pain of our Suffering Christ on the cross. It’s counting the cost of aligning your will to His. When we count the cost of following Christ, we also can expect to count the blessings of serving Him. Lord, words cannot begin to describe the joy of being in relationship with You! Grant me the courage and boldness to take up my own cross to follow You. And when I am weak and weary, remind me that You give strength in my weakness to do the very thing You’ve called me to do. In Your Name, Jesus, I pray. Amen. When Jesus bore our sins on the cross, it was and remains the greatest sacrifice. Jesus took on the curse, the guilt, and the punishment of our sin. Think about this. Here an innocent, blameless man voluntarily takes on the role of guilt-bearer. While many identify Jesus as Savior and Lord, the title of guilt-bearer took on a role new meaning from the perspective of the cross. What guilt and shame are you carrying? Oftentimes, our spiritual progress is hindered when the chains of condemnation arrest us. Even when appearing to be free, regrets and missteps may bind us. You may have raised the question, “How could a perfect God forgive me with my imperfections?” God answered this question through His only begotten Son, Jesus, accepting the call of surrender. As Christ surrendered His self for us, we are called to surrender our will for His. He is not asking us to do something that He was unwilling to do. 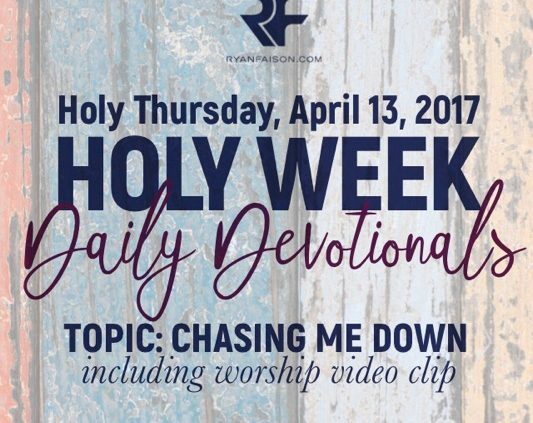 He modeled surrender before the cross, at the cross and after the cross. Today, you may be at a crossroads. 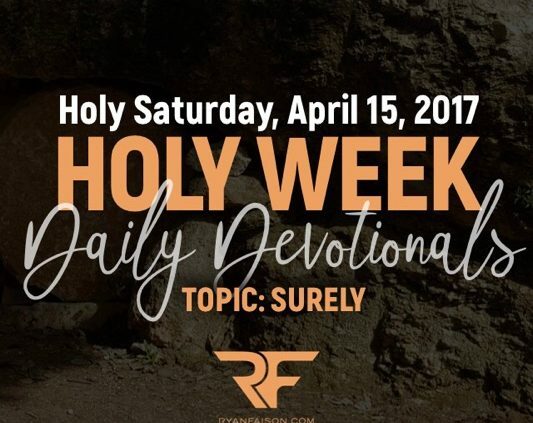 As we reflect on the life of Jesus this Holy Week, you may find it challenging to surrender and submit because of the cost. Don’t fear. When we surrender to God’s will, there will always be a price. But the price of surrender pales in comparison to the joy of relationship with Jesus. Let’s not forsake the call of surrender – the blessings far outweigh the cost. Lord, thank you for Your sacrifice on the Cross. As you’ve modeled surrender on my behalf, I make a commitment to you today to surrender my will to Yours. Grant me the courage to follow You everyday. As I reflect on Your sacrifice, may I never the price you paid. Thank you for giving your life for mine. In Jesus Name. Amen. In 1 John, Jesus is described as the propitiation for our sins. While we often do not use this word in our modern vernacular, it does befit us to explore what this means. Propitiation was a way to satisfy the anger of God whose holy standard was violated by our sin. In the Old Testament, sacrifices were offered to make amends. But, the Scriptures highlight the fact that Jesus actually embodied the full measure of sacrifice for our violation. Jesus made this sacrifice by dying on the cross for the sins of not only Christians, but also the whole world. What does this mean for us? There is no sin that you’ve committed that is not covered by the sacrifice of Jesus Christ. Remaining in a place of condemnation and shame over past offenses and sins rejects what Jesus gave His life for. God’s heart for you demanded that His Son Jesus be offered to you as a gift for new life. On this day, will you accept the gift of Jesus? Jesus died for everyone. And His death on the cross extends forgiveness for all those who enter into relationship with Him. If you’re a Christian (Christ-follower), pray that God will continue to reveal to you the depth, width and height of His love. If you’re searching and investigating the truth of Scripture, my prayer for you is that as you read the Bible, the truth of Christ’s sacrifice and its meaning will change your life forever. Lord, remind me that you offer forgiveness for my sins and faith to live a life that represents You. I humble myself before You, recognizing that I need You to live a fulfilling, fruitful life. 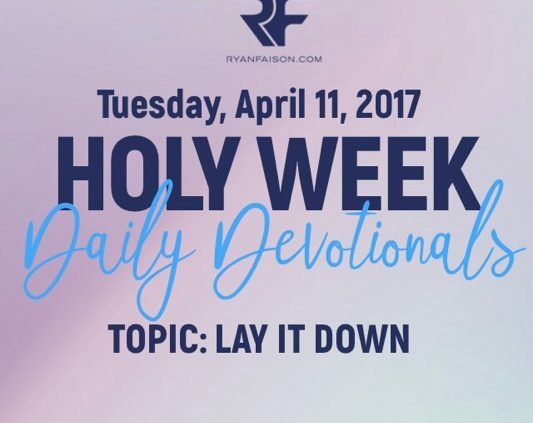 During this Holy Week, help me to know You are near and ready to offer restoration for my brokenness. In Jesus Name. Amen.